This article provides information on importing a QTouch® project generated from START to IAR Embedded Workbench. Go to START and create your QTouch project. Detailed information on how to create a QTouch project in START can be found on the "Generate User Board Touch Project" page. 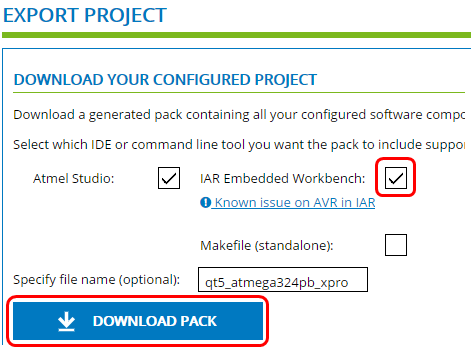 Once you've configured your project and are ready to export, ensure that the IAR Embedded Workbench option is selected. In this example, the project name is qt5_atmega324pb_xpro. We will be referencing this project throughout the rest of the step-by-step instructions on this page. Rename the downloaded package from qt5_atmega324pb_xpro.atzip to qt5_atmega324pb_xpro.zip. Create a new folder and name it qt5_atmega324pb_xpro. 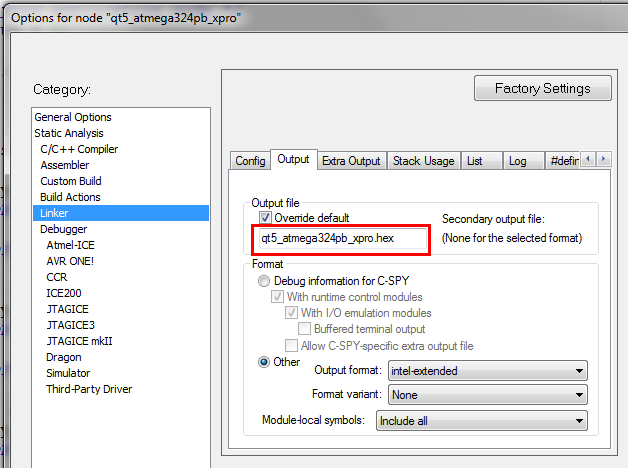 Then, extract the contents of qt5_atmega324pb_xpro.zip to this new folder. Open IAR Embedded Workbench. 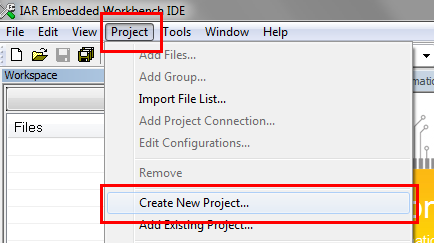 In the top menu, select Project > Create New Project. 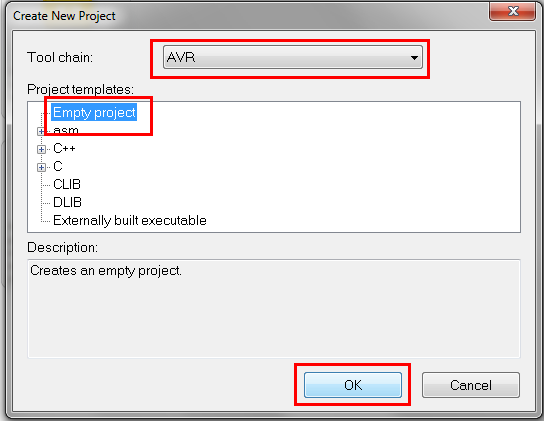 Create an 'Empty Project' for the AVR toolchain. Browse for the qt5_atmega324pb_xpro folder created in Step 4 and give this newly created project a name. The project will then be created and displayed in workspace. 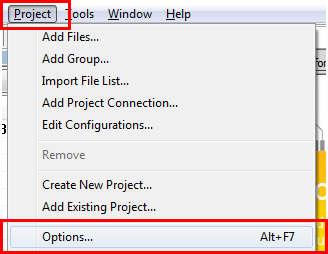 Select Project > Add Project Connection and select 'IAR Project Connection' in the subsequent window. 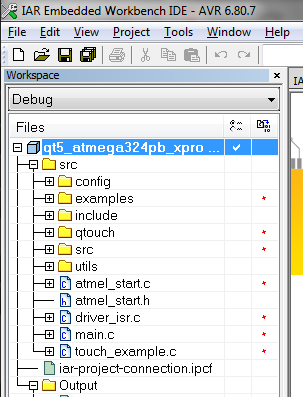 Look for the iar-project-connection.ipcf file inside the qt5_atmega324pb_xpro folder and click Open. You may ignore any warning that appears. The source files generated from START will be added to the IAR project file. In 'General Options' select the 'Normal DLIB' option in the 'Library Configuration' tab. The stack memory set by default is not sufficient. 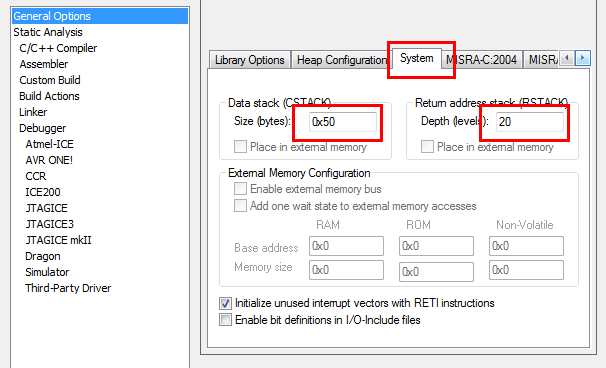 Select the 'System' tab and update the stack size as shown below. Click on the Override default box and change the output file extension to .hex. Under 'Format', select 'Others' and select 'intel-extended' from the drop-down menu. Include touch_example.h file at the top of the main file after inclusion of atmel_start.h file as #include "touch_example.h". Note: An example on using the touch APIs and getting touch sensor state is given in touch_example.c file. The project is ready to be built and tested. Press F7 to build the project. 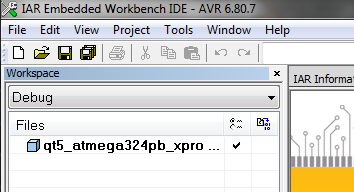 If IAR Embedded Workbench asks you to save the workspace, give it a name and then click Save. The built .hex can be found in the ..\Debug\Exe\ project folder.